In August of 2014, I believe it was my niece that sent me a challenge on Facebook, to post something I was thankful for each day, every day, for a week. I found it impossible to narrow my list down to just seven things. So I broke each day into three sections, but actually each of those sections could be broken down several times over. Many people use the month of November to post each day something they are thankful for. I believe my “thankful” list could be broken down to cover the 30 days of November and then some! On top of that, I have multitude of blessing that I’m sure aren’t covered here, though I did try to make by categories broad enough to cover almost everything. 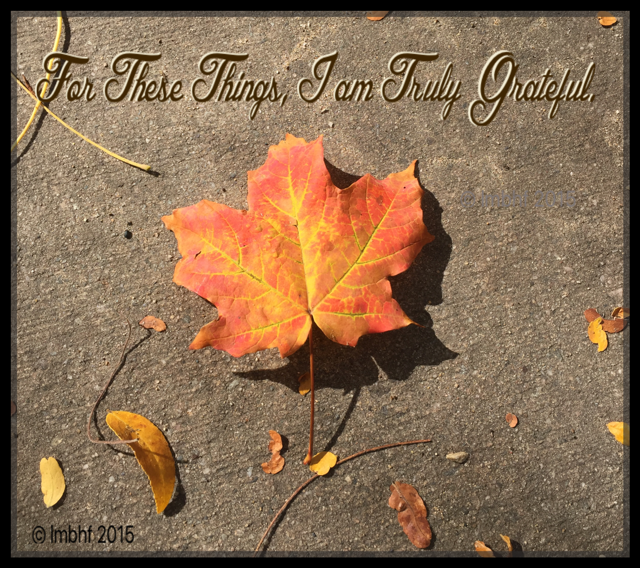 So here it is My Thankful List, just as relevant today as it was over a year ago when I wrote it, with just a couple of minor updates. I hope it inspires others to count their blessings as well. Everyone has blessings, and though they are as varied as the individuals, by counting our blessings (not comparing them) we’ll be reminded of the joy they bring us every day! I’m thankful for my immediate family and my ability to love & care for them and for the love and care I receive from them. My husband, Darren who can be very sweet, charming and charismatic & all we’ve been through together and the life we share. My Children, my precious daughters and dear friends Hillori & Tarrin, my strong & sweet boys, Micheal and Joseph & my amazing, loving children-in-law, Alyssa, Kaitlin, Brad, and David (my son-in-law to be (almost)). My sweet, sweet innocent grandbabies G1, G2, G3 and G4 who bring so much delight and joy to our lives! For my amazing, inspiring parents Bob & Jean Hill. All I am and the foundation of my world comes from their stellar example of unconditional love and humble wisdom. The world is not quite as sweet without them here but it is definitely a better place because they were here! My four sisters, who are my dear friends and my examples of beautiful women inside & out & their faithful spouses, my bros-in-law who are good men and who love & support them and are also my friends. My brother Bobby, though I never met him has always had a special place in my heart & mind. My many nieces, nephews, and grandnieces & grandnephews who have filled my life with love, joy and pride, from the very first one who was born when I was just seven to the most recent one to be born just last year! I’m thankful for my In-laws, parents-in-law, sisters-in-law & brothers-in-law, nieces & nephews and their spouses and grand nieces & nephews. Though most of them are far away, I love & care about them and am thankful for Facebook that allows me to be part of their lives on a regular basis. I’m thankful for extended-extended family, aunts & uncles and cousins (who I also get to stay closer to because of Facebook) and all they mean to my life. Friends who have come in and out of my life through the years and who enrich it in so many ways. I’m thankful for my students, each and every one, past, present and future, whether they were my students for a few days or a few years and whether I was directly their teacher or the administrator of their school. For the opportunity to be part of their lives, to love & teach them and hopefully touch their lives, some in small ways & others in big ways. And for the way they have loved me, taught me things and touched my life. Health, that of my loved ones and my own. For nutritious (and delicious) food, clean living conditions, modern medicine,and the knowledge and ability to do what we need to do to be healthy. My nice home and many possessions, comfort and warmth, security, transportation, and my pets. My yard and love of gardening that I learned by my daddy’s side in his beautiful yard. I’m thankful for knowledge, intellect, my education & the ability to learn & grow as a person. I’m thankful for our country, though it’s not perfect it comes closer than the others & for freedom and those who sacrificed so we could have it. I’m thankful for nature, sunshine, rain and snow, seasons, lakes, streams, rivers, puddles, oceans, mountains, forests & trees, meadows and plants, flowers, bugs, and animals and all those sorts of things!! I’m thankful for the arts, literature, music, color & beauty and their ability to stir and move my soul. I’m for my ability to be creative, my many interests & hobbies and the joy they bring me. I’m thankful for the love, compassion, morality, generosity, and goodness that exist in the world. I’m thankful for science and technology, though it boggles my mind, it shows me how much more there is to learn and know about our world. I’m thankful for history, humanity & all those that came before us and our time and paved the way for those of us living in the world today. I’m thankful for the undeniably purposeful and intelligent design of our world and the spiritual awareness that allows me to be thankful for all of these things and oh so, so many more!! What a great post – you need to remember the important things in life. Thank you Tayrina, I will check out your blog! Love this! It can be so easy to take all we have for granted. Such a great reminder not to! Technology is amazing and wonderful, isn’t it!